The IEA Solar Heating and Cooling (SHC) programme has recently updated its country report on Sweden’s solar thermal industry, pointing out the increasing competition with other energy technologies and the factors exacerbating the decline in sales. It seems as if not even the rather high national carbon tax can reinvigorate the country’s solar heat market. Especially in the residential segment, fossil fuels have already been phased out and biomass boilers plus district heating have become the standard in cities, while heat pumps dominate in rural areas. 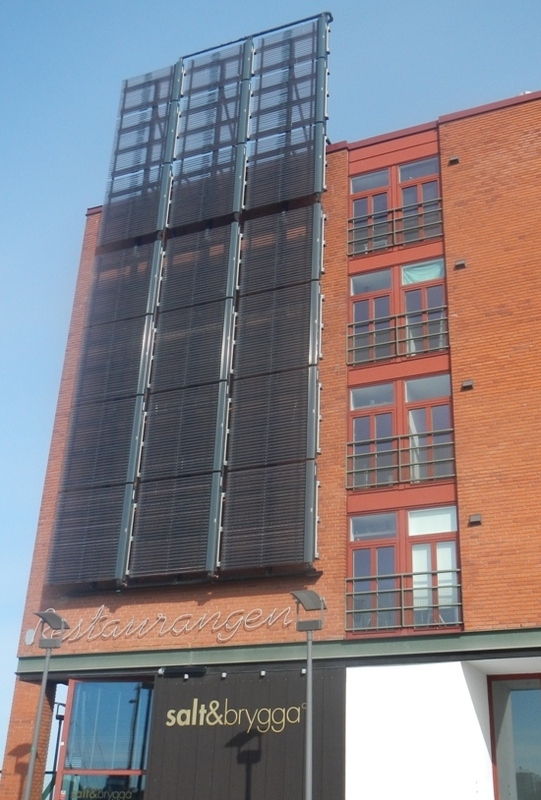 The photo shows a solar facade with vacuum tube collectors in the Swedish city of Malmö. Sweden’s solar thermal market has experienced a rapid decline since investment subsidies for collectors were stopped in 2011. The budget was about EUR 1 million annually, while PV started out much higher, at EUR 5 to 10 million per year. The updated IEA SHC report on Sweden shows that the market price of flat plate collectors has dropped in line with the overall development of collector prices across Europe. Vaccuum tube collectors, however, have become more expensive, probably because most of the small companies, which had imported from China, are no longer operating. This has left only a few businesses which make higher-quality products. About half of the market is now being served by local manufacturers, according to the country portrait. National carbon tax as a market driver? National targets for 2020 are a 40 % reduction in greenhouse gas emissions, at least a 50 % renewable share in consumption, and a 20 % higher efficiency in the end use of energy. Moreover, fossil fuels for space heating and domestic hot water are to be phased out by 2020. However, there are no specific mandatory targets for renewable heating and cooling. Despite the above-mentioned lack of direct support for solar thermal, the country portrait lists some current sets of rules which could stabilise deployment. For instance, the Swedish building regulations include solar energy use in energy performance calculations. Furthermore, there are tax deductions for building repairs, conversions and extensions if a solar heating system is installed. They offer a reduction of up to 30 % in installation and connection costs. IEA SHC is an international research and information platform for solar heating and cooling technologies. It is used by over 200 experts from 21 countries and five organisations to conduct collaborative research on a wide range of topics, from green quarters in urban planning to future storage tank designs and the integration of large-scale solar fields into district heating and cooling networks. As part of its services, the IEA SHC programme publishes updated market profiles of all 20 member countries each year. You can find the list of countries online and a link to their profile at the bottom of each country page.